Adventures. Beach. Waterfalls. Shopping. Trekking and anything in between. Our cousin invited us to her birthday in Enchanted Kingdom. Just on time too my sister gone there a week ago but she didn’t enjoy it because she was part of the committee in the company outing done in Enchanted Kingdom. My sister agreed right away because she wanted to ride the extreme rides but had no time. But for me I’ve been there 4 times so I was having second thought, in the end I agreed anyway it’s a celebration too so I can talk to our cousin longer. Enchanted kingdom is a theme park, it is considered as the “Disneyland of the Philippines”. It is located in Santa Rosa, Laguna. While our niece, nephew and my sister were enjoying the rides, me and our cousin were sitting on the bench talking. They were laughing at us because according to them it’s sign of aging. They wanted to ride most of the extreme rides but the lines were long, took half hour or more to be accommodated. Ekstreme Ride. It is a thrilling. My sister loved it. She loves the exhilarating feeling from being dropped from a height of 120 feet with a maximum speed of 47mph. Ekstreme Ride takes a minute. It slowly goes up and you can see the aerial view. Our nephew didn’t notice that they would be dropped and before he knew it they were already on the ground. He said it was fast. The second ride was the Flying fiesta. It is a swing ride that gradually increases the speed and tilts, which create a wave-live motion. They wanted to try more rides but we knew they couldn’t, so I told them to sum all the extreme rides for me space shuttle would be the best. This ride had long line that took them more than half hour to be accommodated. One can experience 360 degrees turn. It is a two minute ride. After they rode it our niece got dizzy and stop riding. 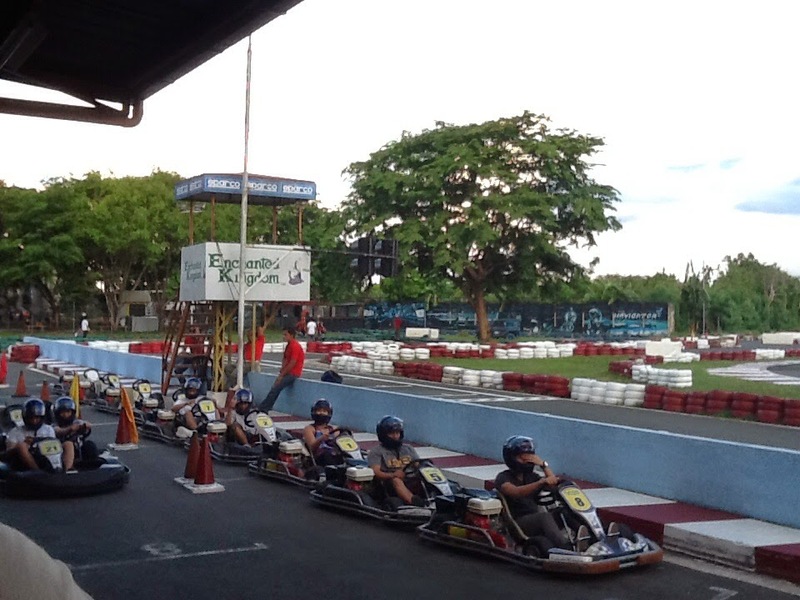 Because of a long queue in most of the rides, my cousin and our nephew tried Kart-Trak. If you want to experience to be a race driver for a day why not try it. 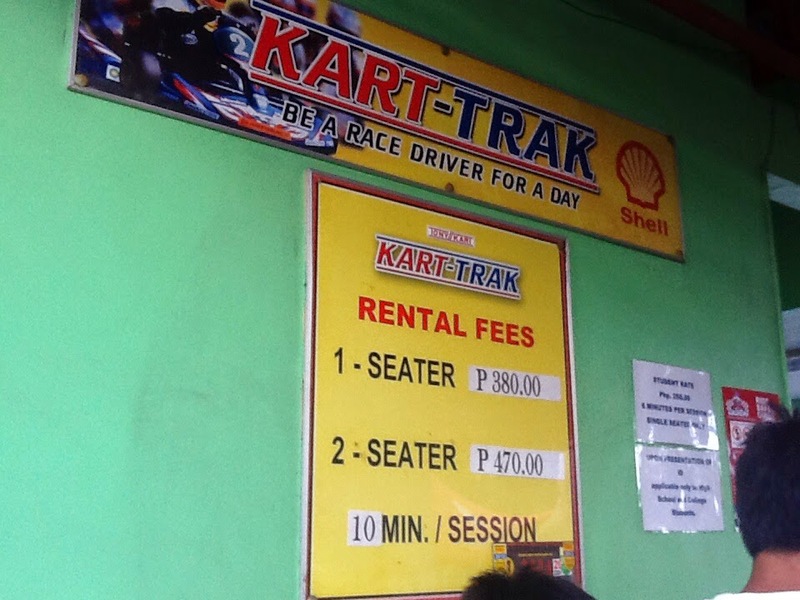 They took the 2-seater for 470.00 pesos and that is for 10 minutes session. They were already done with the car racing but those who were queuing for space shuttle, they were still there. After the space shuttle we decided to have a relaxing ride and that was the Grand Carousel. And that made them burst out in laughter because me and my cousin joined. Why not, not bad for a last ride before going home. It was a fun day even was so hot and humid.